When EasyJet in November reported a pre-tax profit of £478 million (US$785 million) for fiscal 2013—a 51% jump from the previous year—it caused a considerable flap with the shareholders of rival budget airline Ryanair. The stockholders’ vexation was understandable, given that management at Ryanair expects that airline’s earnings to drop to €500 million (around $675 million) for its fiscal year ending March 31, down from a record €569 million ($767 million) in 2012. What’s more, Ryanair’s stock price has gone up a mere 18% this year while EasyJet’s has soared 69%. More salt in the wound: EasyJet management is hiking the company’s 2013 dividend payout to £133 million ($217 million) and bolstering that with a special one-time distribution of £175 million ($282 million). Irate Ryanair shareholders got to air their grievances at the company’s recent annual meeting, with blame falling squarely on the shoulders of CEO Michael O’Leary. At the gathering, O’Leary conceded that the airline’s woes were due in large part to his own “personal character deformities” and that he was "very happy to take the blame or responsibility if we have a macho or abrupt culture." He promised that, in the future, the airline—known for it’s less-than-warm-and-fuzzy dealings with customers—would not "unnecessarily piss people off." It remains to be seen if the Duke of Discomfort can make the promise stick. Certainly, his own macho approach stands in stark contrast to the easy-going manner of EasyJet CEO Carolyn McCall. Since becoming chief executive in 2010, McCall has shown a deft hand in dealing with the airline’s testy founder and largest shareholder, Sir Stelios Haji-Ioannou. She has also devised a raft of measures to improve customer service, including the introduction of allocated seating and fast-track security, which have helped EasyJet attract more-affluent older fliers and business passengers. For his part, O’Leary insists it will take Ryanair just three to six months to close the gap, as it rolls out its own improvements. That long list includes a simplified online booking process, allowing passengers to take a second, small piece of cabin baggage on board flights and the introduction of allocated seating. The no-frills carrier has already lowered the fee charged to customers who have checked in online but need their boarding pass reprinted at the airport. That charge now stands at €15, down from €70. The company’s relations with the media should improve with the arrival of the carrier’s first-ever marketing chief, who will take over as spokesman for the airline. But the new marketing boss will have a tall task tarting up Ryanair’s image with air travelers. 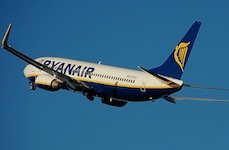 In a survey released in September, consumers said Ryanair had the worst customer service of the UK’s 100 biggest brands.